By now it should be pretty clear that I'm a fan of Android. It's a platform exciting enough to have driven me from my comfortable niche writing Windows desktop software into the world of mobile application development. 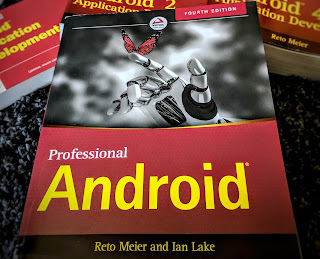 Now, I'm (extremely) happy to say that Google have let me turn my part-time amateur Android developer support and evangelism into a full time role as an Android Developer Advocate. I'll be based in Google's London office helping developers in EMEA produce the sort of awesome mobile applications I've always known are possible. It's a particularly exciting time in Android with version 1.5 of the SDK (now available in preview) featuring home-screen widgets, live folders, and video recording. So what exactly is a developer advocate? It's an opportunity to work on the inside, helping the developer community on two fronts: first by working with development teams to improve and perfect their apps, and secondly as a conduit back to the Android development team - helping to guide future Android development in a way that makes it even easier for developers to create great apps. I'll continue to blog about my own projects, as well as taking some close looks at the Android SDK as it grows and evolves. I'll also continue to feature new Google developer products as they're released, as well as my own projects and 'how-to guides'. What you won't see here, for obvious reasons, is speculation on future Google products, Google secrets, or new product announcements. As a member of the Developer Relations team in EMEA, I'll also take on some of the responsibility for Google's UK Developers Blog, so expect to see some more Android content from me there soon. Over the past year I've found myself using Twitter (@retomeier) when I spot cool new products, and will probably continue to do that rather than dedicate whole blog posts to track every new product announcement. Google I/O - Should I Come? Yes! I'm really excited about Google I/O this year. There's going to be a ridiculous amount of useful information for people doing development with Google's developer offerings. Android developers in particular won't go away disappointed. I really hope to see some of you there - particularly if your based in any of the EMEA countries - so if you come along, be sure to come over and say 'Hi!'. Congratulations Reto you deserved it! Nice post. it is a great and exciting time for Android developers. and now i waiting to see what new, innovative mobile applications, ideas and technologies are unveiled at the Nokia Forum developer conference in Sydney, Australia on 2nd March 2010. Nokia experts would be giving tips about business opportunities and latest developments to developers in this one day free event.